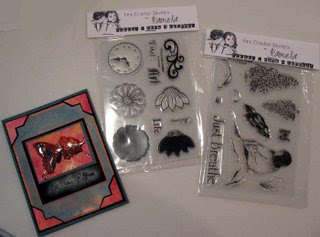 It is Giveaway, Day 6 and today we have some special stamps from Firecracker Designs by Pamela. The lucky winner of this give away will receive two beautiful clear acrylic stamp sets (each set is approximately 5" x 7"). Today's eye candy was made using Firecracker Designs by Pamela stamps. The background is the Cling and Scrunch Technique from the June 2006 of the Technique Junkie Newsletter, and the gold/orange areas are the Cotton Color Technique from the April Issue of the newsletter. To enter the giveaway for today, simply leave a comment on this blog entry telling Pat that you would like to enter by 11:59pm EST on Sunday, October 7th.